DR.BRAUSKLMCET 2019 : Dr. B.R. Ambedkar University Entrance Test 2019 - Dr. B.R. Ambedkar University, Srikakulam invites applications for admission through Dr. B.R. 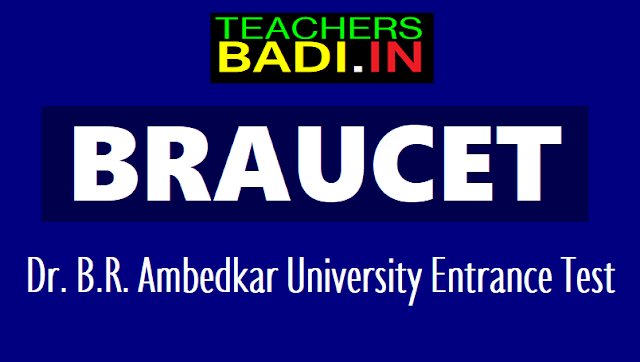 Ambedkar University Common Entrance Test (DR.BRAUSKLMCET-2019), into various Arts and Sciences Courses offered in Campus College of Dr. B. R. Ambedkar University, Srikakulam, and Colleges affiliated to B.R.A.U. offering P.G. Courses for the academic year 2019-2020. Dr.BRAUSKLMCET 2019 and Last date to apply is 25.04.2019: Dr. B. R. Ambedkar University, Srikakulam invites applications for admission through Dr. B. R. Ambedkar University Common entrance Test (Dr. BRAUSKLMCET, 2019), into various Arts and Sciences Courses offered in Campus College of Dr. B. R. Ambedkar University (Dr.BRAU-SKLM), and Colleges affiliated to B.R.A.U. offering P.G. Courses for the academic year 2019-20. Test Centres: Srikakulam, Palasa, Bobbili, Visakhapatnam, Vizianagaram, Rajahmahendravaram, Vijayawada, Tirupathi. Last date for submission of online applications: 25.04.2019. Commencement of Entrance Test (Tentative): 13th,14th, 15th, 16th May, 2019. Date of Publication of Results: 21.05.2019.